No more struggling with coiled pins! 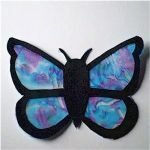 Larger sized “E” beads make Easy Beaded Butterfly Pins easier for kids. This craft will make beautiful gifts for friends and family. Make some for yourself too. Trivia: Butterflies are found on all continents except Antarctica, and scientists estimate that there are approximately 12-15,000 species of butterflies and many more that have not been discovered. Coiless Safety Pins - 2¼"
Each row hanging down is a size 2 pin with "E" beads strung on it. Open these pins and string beads following the pattern chosen. Keep in mind that you are stringing the beads upside-down so you will start at the top with of each row and work down. Then turn the pin upside-down. Use pliers to squeeze the pin head closed permanently. Note: Glass beads are are irregular in size. You will not be able to use the larger "E" beads in your package. It may look like the pins will not close but as long as the tip shows, you can usually just press the point into the pin head opening. The pin will bend out slightly to fit the beads snuggly into place. Open up the coiless pin. You will need to bend it open to at least a 60 degree angle to get the beads on. Beginning with the beaded pin to the far right, thread the coil of that beaded pin onto the coiless pin, around the bend and over to the head of the pin. Slide on a 4mm bead. Then the next beaded pin, followed by another 4mm bead. Continue until you have threaded on all pins and finished off with a final 4mm bead. These beads help hold the pins in place and keep them from sliding around the coiless pin. Are the E Beads and the 4mm beads the same? I cannot tell from the picture.